These fantastic chair and table sets are absolutely brilliant value for money – but to bring them to you this cheap we have NOT compromised on strength!. Supplied flat pack for home assembly. Chair supplied flat-pack for self assembly. Chair prices are fixed regardless of quantity ordered. We may be able to reduce the delivery cost per chair on large orders – please call for further details. Phone 020 888 54321 with any questions or queries. Please send a valid phone number with your order. We will contact you to arrange immediate delivery once the chairs have landed in the UK. Prices include VAT and a VAT invoice will be issued on all purchases. Rubberwood is a hardwood from the maple family of woods. It has very little tendancy to warp or crack and is one of the most durable timbers used in furniture manufacture – it is much stronger than pine!! As a member of the maple family, rubberwood has a dense grain making it very strong. Like maple, rubberwood is a sap producing species, but instead of producing sap it produces latex. Rubberwood trees produce all the latex used for all rubber based products. Rubberwood is the most ecologically “friendly” timber, as it is grown specifically for latex production. After 25 to 30 years the latex production in an individual tree dries up and the trees are chopped down, making the furniture from what is esentially a “waste” material. Please note we do not deliver to certain UK postcodes, such as N Ireland, Scottish Highlands, Islands and other remote areas of the UK – if in doubt, please call 020 888 54321 for further information, before ordering. Please note that the courier will deliver between 8am and 6pm (Monday to Friday) and we have no control over the time. However, we will try and arrange a specific day for delivery if you let us know by email, at the time of ordering. 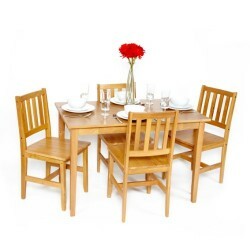 Bistro Cade table and chairs The table and chairs are basic but good value for money. Delivery took a long time and was tricky to organise. The main problem though, is that 3 chair legs had sharp metal spikes sticking out of the bottom of them, which resulted in a really scratched up wooden floor. We didn’t notice until it was too late, but have used pliers to remove the metal now. good looking The set is comprised of good materials. Rather difficult to build – especially the chairs. You need to step back and distinguish every piece – some look almost the same but have a different location.